We guarantee our sod that we supply for one year after installation (only with an underground sprinkler system and our yearly application program). If the turf grass is maintained and cared for properly, we will gladly replace the product at no extra charge to you. We guarantee our full priced trees and shrubs for one year after installation with in-ground waste system. If your tree or shrub is properly cared for, we will gladly replace it free of charge. You also get the 1st 2 tree and shrub treatments free. Stone retainer walls or paving stone work is guaranteed for five years after installation. Our concrete curbs, sidewalk or driveways are guaranteed workmanship for one year after installation on any workmanship. We do not cover frost heaves, cracks, or breakage (no salt application for 3 years). 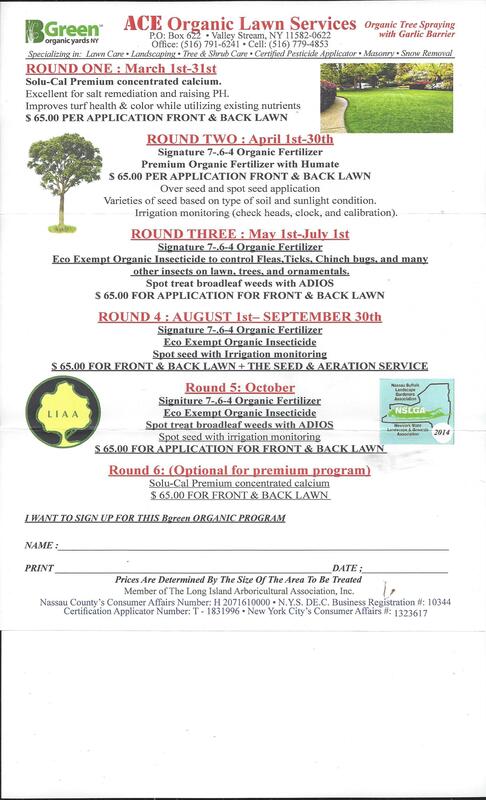 Our seeding (or lawn renovation) is guaranteed for one month after seed has been applied. We will reapply seed if it does not take and give you free mowing. Our pruning (trimming) is guaranteed not to kill, harm, or destroy trees, if your tree is harmed during pruning, we will gladly replace it with a tree valued up to $300.00 or take measures to correct the problem via injections and other tree and shrub applications. Irrigation systems for one year after installation, if proper care is taken to protect pipes and heads, we will gladly replace any head, pipe, or fixture that we supply & install via Ace irrigation, 516.812.8606. Your site is guaranteed from having any major bumps, dip holes, and drainage problem's that are caused by us. Under this warranty program, we do not cover sinkage. We will not cover your site if there have been previous drainage problems, sinkage problems, or a general problem with your grade, and or window wells. Plants, shrubs, and all general plant material are covered for one year after installation. If maintained and cared for properly, we will gladly replace the product at no extra charge to you (only with underground water system). Your fertilizer application is to be even and not to have lighter/darker patches anywhere on turf grass. In the event of an application burn (grass goes yellow or dies) you will be entitled to a free aeration/power raking for the next season. If your property is damaged during construction/working, we will gladly replace anything object or thing we destroy. If over $500.00, we will place a claim through our commercial general liability, or if approved, pay settlement by cheques or credit towards sites work. After any installation, construction, or service we will call your person within two weeks of site completion. We will fill out a report outlining problem areas, areas of concern, and potential and future problem areas. We will replace any dead patches of turf grass, provided site has been maintained. All irrigation systems will for the first year, fall under our plan, first winterization, and start up. If you decided to use another party, you will void your warranty. We schedule monthly calls for service check up is for up to three months after site has been complete. After tree installation, we will prune as necessary (for one year), if you prune, you will void the warranty, and your tree and plant material will not be covered. Plant bed maintenance - we will provide you with a weed free garden. We will fix any curbs, parking barriers, and asphalt that are caused due to our workers, vehicles, and other tools or equipment.